Own your piece of paradise with this Oceanfront Condo... You can see it all from here. 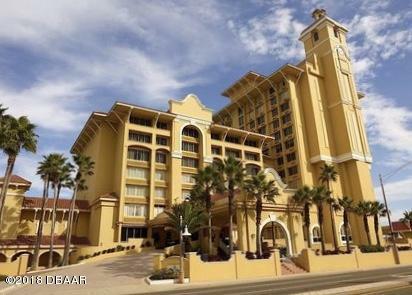 Overlooking Daytona Beach area, catch ocean views, the speedway and the e-zone. One of the few Convention Center Hotels is Daytona. This ''Resort Style'' Spa is one of the best you will ever experience! Walking distance to entertainment, shops, restaurants, water parks, etc..A private beach, this is the no drive beach area.Completely furnished. Ocean view heated pool. Full service SPA and fine dining restaurant veranda lounge. This unit features a king size bed, a kitchenette with mini-fridge, microwave, cherry cabinets & Granite counter tops in the kitchen and bathroom. Don't forget coffee and sunrises from your private balcony.